Do you find riding on a boat relaxing? Well as some of you know I went on a fishing trip yesterday. We went out on a boat and spent the day. I found it to be very theraputic and relaxing and would love to do it more often. 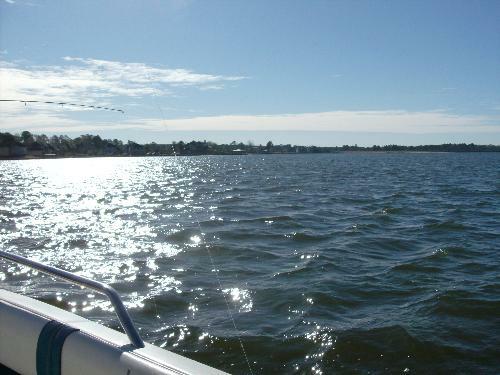 Do you find boat rides to be relaxing? When was the last time you where on a boat? I have only gone on quick tour trips and did not found it relaxing at all. lol it was exciting but I guess a fishing trip is different. Thru my own experience, riding a boat really a great peace of mind. Where I am in adventurous feeling seems like in the new world. Especially, when at sunrise time where I can obviously see the great combination of nature elements in my view. Very colorful thus enhance the affect and effect, soothes my sight and mind. My last time on a bot was last month for my inshore group fishing. I have been on a passenger boat, a cruise down our river and I loved it very much. It was so nice to go down the river, it was a two hour trip. They had one with a restaurant but I didn't go to the that dinner one though. hello moneymommy yes, i love going out on the water like that on any kind of a boat. one of my brother-in-laws and sister-in-law's have a pontoon boat that sometimes myself and my family will meet them at the lake when that they go camping and we will all enjoy riding on their pontoon boat when that we can. my brother used to own a waver runner, and boy was that ever fun to ride across the water. and i have also been on sightseeing cruises on boats before like places in Florida. but the only kind of a boat that i will not ever go on in my life again is a deep sea fishing boat. oh my god. my hubby and i went to Destin, Florida several years ago to go deep sea fishing with some friends of ours. man, did i ever get sick out on that ocean. and i didn't know that once i got out there like that and got sea-sick, that nobody would bring me back to shore! what an awful experience that was for me that day. i will be waving bye bye at my hubby from the sand the next time that he decides to go deep sea fishing like that. see ya! lol and that morning before that we went deep sea fishing, i did take motion sickness pills. they didn't do me any good at all. take care and have a beautiful day today! I really don't like to be on the water, must have drown in my last life. I have come close to drowning a couple of times in this one. It is relaxing if you don't have do the riding yourself.Going out fishing is pleausre and enjoyable too.I must admit that I have not had much of it though simply because there are no rivers' nearby the city I stay in.You need to drive at least 90 KM before you can get such a pleasure which is not often I do.